Great job last week – each and every one of you did really well! Please keep up the good work – and don’t worry where you are in the group – everybody has a different natural running pace and it doesn’t matter whether you are at the front of the pack or in the back, as long as you keep running when you are supposed to. This week we will take a short trip onto the canal and then turn back and head towards Bonnie’s house at 97 Hamilton Terrace. Just a few words of caution – you will find that you can only run two abreast on the narrow canal path, and it would actually be better if you kept to single file – there are a lot of bikers on the canal, and not all of them have bells to warn you they are coming. Keep your eyes open – I will yell out when a bike is coming along, and you will need to get into single file on the side farthest away from the water – as we head out, this will be on the left, and when we turn around to come back, it will be on the right. That way the bikes can stay closer to the water. We have had a runner or two fall into the canal, so we do try to keep as far away from the water as possible! There will be some street running too, so please be careful at the crossings, and don’t just blindly follow the person in front of you without checking for cars. Coffee at Bonnie’s will give us a chance to get to know each other a little more – I always say the best part of running is the socialising over coffee after! Chris Roberts will be coming along to talk to us about the half marathon – she has worked hard to find a race that works with the school calendar, and that is a good course for you all to run (read that as not a hilly course!). Honestly, everyone is excited that we have such an enthusiastic group of beginners! One last thing – Kelly Montanaro will be at Starbucks at 8:15 to take orders and collect money for the T-shirts, so if you want one, please bring your money with you. What a great job you all did last week! You are all doing so well! For the benefit of those who were not there last week, plus those new additions to our list, I will recap a bit. We will be following a walk/jog schedule which will keep building up over the next few weeks, following a program which is designed to have us ready for the half marathon in the spring. You are all welcome in the group, regardless of whether you plan to run the half marathon or not – some of you simply want to learn how to run long distances, and that is fine. Others may not even want to run long distances, but simply want to learn how to run, and that is fine too. As I told you last week, the information about the planned half marathon will be coming to you sometime this week or next. It may seem far fetched to you at this point that you could possibly run it at this point, but believe me, if you stick to the program, and continue to run on Tuesdays and Thursdays (and eventually add a 3rd run) you will be able to do it. All your coaches have been through the beginner group in some form and are a great resource for you. Now that we are running slightly longer intervals, you are developing a running style, so if you are looking to buy running shoes, now is the time to do it. At Runner’s Need (they have several locations around London) they will watch you while you run on a treadmill and assess your running style and recommend shoes based on that. A pair of running shoes will last you roughly 400 miles so it would be a good idea to write the date of purchase down (maybe on the inside of the shoe). In general it is recommended that you go up 1/2 to 1 size in running shoes as feet tend to swell when running. We will also be running rain or shine so at some point, you will need a good rain jacket, although those can be bought in lots of different stores, not necessarily Runners Need. For the first few weeks, we will be staying local and running a loop back to St John’s Wood, but starting sometime in mid October, we will start to mix it up, running some loops, and some destination runs, so for the latter you will need to carry an Oyster card, but I will let you know when we will be doing that. That is all for now – I look forward to seeing you all on Thursday! I heard you were all great last week, showing up even when the weather wasn’t so wonderful – well done! This week we will be adding one 3 minute interval running interval to our two minute ones. It is absolutely essential we keep the pace very very slow so we don’t allow our heart rates to get too high, both for psychological reasons (so you don’t feel exhausted and worn out when you finish, and start hating it) and for physiological ones (as most of you haven’t run before, you need to give your bodies time to adjust so as to keep injuries at bay). I know some of you feel as though you could run faster, but there are other groups for that – please let me know if you feel you could possibly move up – if you have any experience in running whatsoever, running slowly may actually hurt you by altering your gait and creating unnecessary impact on your joints. One last thing – I know a couple of people have not been receiving the emails – please let me know if there is anyone that is missing from the list! Most of you probably know that we have a website – womenrunningtheworld.com, but for those who do not, the weekly email will be posted there under the beginners tab. I’m looking forward to seeing you all on Thursday! Wow, what a start to our running – even the weather co-operated! It was lovely to meet you all. The group grew overnight, which is great but at this point there is no need to ‘recruit’ anyone else to the group – it will become too hard to run through the city (which we will start doing fairly soon) if we have any more members. Click here for our program leading up to the half marathon. I know these are early days yet, but the ultimate goal is to get each of you ready to run a half. Some of you want that goal, others just want to run but not do long distances and that is also fine, there is no obligation to run the half at all. You have all been introduced to Betsy and Bonnie – they (and I) have come through the beginner group in some form, so know what you will be going through over the coming weeks. They will be a great resource for you. The group meets without the coaches on Tuesday mornings to repeat the run we did together the previous Thursday. It is important that you get that second run in each week. If you are not able to meet the group, email everyone and see if you can find someone to run with you at a different time. On Tuesdays (or whenever you do your second weekly run), it’s critical to keep the pace slow. I will be out of town for the run on Thursday, but Betsy and Bonnie will both be there to lead you on the run. We will be introducing some 2 minute running intervals but I am confident you will be fine. I look forward to hearing all about it, and then running with you the following Thursday. 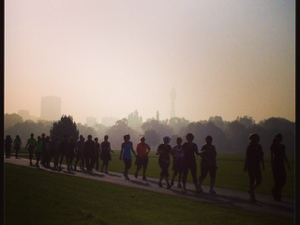 A beautiful photo of the beginners on their first run. Bravo!